When developing an application it makes sense to add logging to this application. The Apache Commons Logging is a way to implement logging to your application independent of the eventually used implementation. 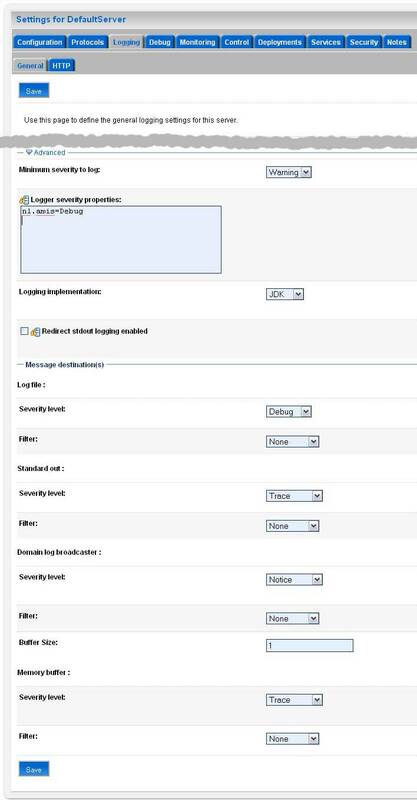 While adding log messages to a Fusion Web Application (ADF) and running this application with JDeveloper the logging is not displayed in the application log window. This is not what expected en certainly undesirable. I created a standard Fusion Web Application (ADF) with a default model and a viewController project. This tells the Apache Commons Logging framework which log implementation to use. 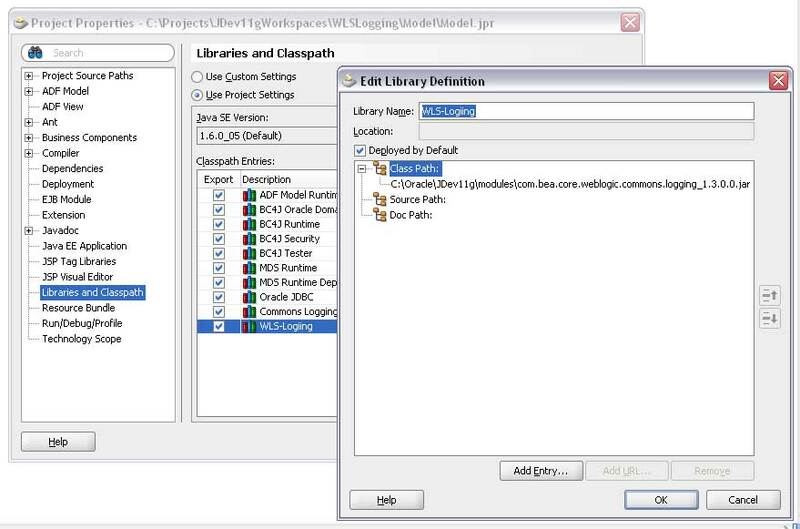 In this case an implementation for the WebLogic Application server. But when running this application an exception is raised, because of the unknown implementation class: weblogic.logging.commons.LogFactoryImpl. We have to add the implementation class(es) to our project. Define in JDeveloper a new Library for this and assign it to both projects. The Library must contain the <JDEV_HOME>\modules\com.bea.core.weblogic.commons.logging_1.3.0.0.jar. Strictly itâ€™s not necessary to add this library to the ViewControler project while this project depends on the Model project with the library added already. When running the Business Components Tester, by running the Application Module, the message is showed as expected. But when running the application, from the ViewController project, there is no debug-message showed in the application log window. For this we have to configure the Weblogic Server. Start the Weblogic application server either by running the View Controller project or start the application server by Run -> Start server Instance. Â Open the WebLogic Console (default: http://localhost:7101/console) and choose to configure the DefaultServer via Environment/Servers. In the advanced section of the Logging tab, you can configure the logging options. With the Logger severity properties itâ€™s possible to assign a log level to s specific class structure. By adding nl.amis=Debug all messages with severity debug or higher from classes beneath nl.amis are displayed when running the application. I am using JDeveloper version 11.1.1.0.1. Be sure that the commons-logging.properties are directly in the source directories of both (Model and ViewController) projects. Will send you a zipfile with my application by email. Hum, which version of Jdev 11 are you using? I followed your steps but could not make it work. How did you get sLog object? I assume from LogFactory.getLog(myObject.class), correct? The commons-logging.properties you mentioned don’t get picked up by EAR file.